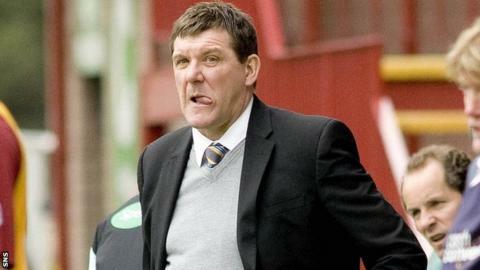 St Johnstone manager Tommy Wright felt his side should have had a free-kick in the build-up to Motherwell's winning goal in the Fir Park side's 2-1 win. Stephen McManus put the Steelmen ahead again after Dave Mackay had cancelled out Lionel Ainsworth's opener. "I think the controversy is that there's a foul on Dave Mackay in the build-up to it," said Wright. "There's confusion with what happens after that, but I think it should have been a foul on Dave Mackay." McManus's header was helped into the net by the hand of St Johnstone defender Steven Anderson, who was booked after the goal had been awarded. "I thought it was a penalty kick, and if it was going to be a penalty kick it was going to be a sending-off and I think that's maybe what he did, he thought it would be a penalty kick and his assistant's told him it was over the line," Wright explained. "So he's right then to award the goal, but we're disappointed that there was a foul on Dave MacKay we thought, he doesn't just go to ground for no reason, and obviously [McManus] is his man and he's been blocked. "We didn't do enough in the first half though, so they probably deserved to be ahead at that time."